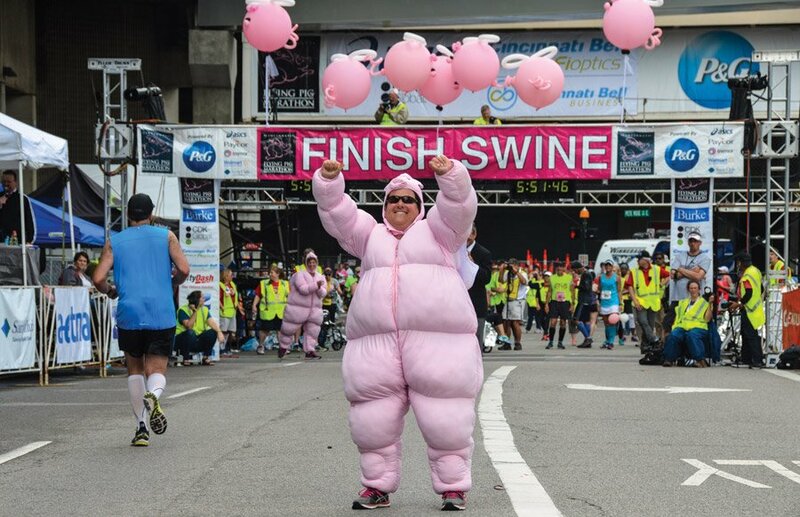 It’s time for one of Cincinnati’s biggest outdoor scenes – Flying Pig Marathon weekend. More than 40,000 participants, with an average of about 20,000 for the Saturday events and 21,000 on Sunday, will run for charity. Approximately 100,000 spectators – Street Squealers – will line the course to inspire and motivate the runners. While the full marathon race is sold out, sister races on May 4 (Little Kings Mile) and May 5 (10K, 5K, Kids Races, PigAbilities and Flying Fur) still had spaces available at press time, as well as the races on May 6 (four-person relay and half marathon). To celebrate its 20th anniversary, the marathon hosted 20 days of community activities leading up to the big weekend. “Our communities along the Flying Pig route have always been very supportive of the marathon, so we wanted to include them in our 20th anniversary,” said Iris Simpson Bush, executive director. Thursday, May 3: The Piggys award show, 5:30-8 p.m., Aronoff Center. Honoring participants, volunteers, sponsors and runners who have registered for the 20th Flying Pig and have done all previous 19 marathons. Tickets start at $25.